The MMQB's Robert Klemko has a great story about a ticket broker hustling his way through the crazy, somewhat-shady secondary ticket market that sprung up at this year's Super Bowl. There's a lot of good stuff in here, including an answer to the question we've all found ourselves asking: Do players in the Super Bowl scalp their own tickets? 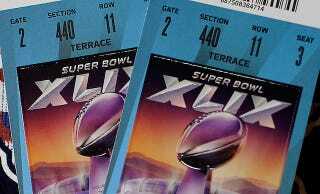 Every player in the NFL has the option to buy two tickets to the Super Bowl. Players on the Super Bowl teams have larger allotments, and the system for distribution varies from team to team. (The league caps the tickets per player at 15). The Seahawks, for instance, allotted 13 tickets to each player—two complimentary and 11 available for purchase at face value of $1,500 for this Super Bowl, according to those interviewed by The MMQB. (The Seahawks and Patriots did not respond to e-mail requests for comment.) If not claimed, the tickets go back to the team owners, who then pump them out to sponsors and the like. "You can make anywhere between $3,000 and $4,000 on each extra ticket," said one Seattle defensive player, who asked for anonymity. "I sold eight. Some go to teammates, but most guys hand their extras off to agents, who sell them for a small cut. Pretty much everybody knows about it now. Word travels fast." A league spokesman told The MMQB that if a team's employees were found to have engaged in reselling tickets at above face value, those individuals and the club would be fined. Said a Seattle lineman: "I don't see anything wrong with it. Somebody's gonna make money off of it, so why shouldn't we?" It's pretty silly that the NFL makes it so that players have to unload their tickets on a black market of sorts, but we should really be thankful that this all goes down in secret. Can you imagine how many more terrible, scolding columns Super Bowl week would be filled with if everyone knew exactly how much each player was scalping his tickets for?